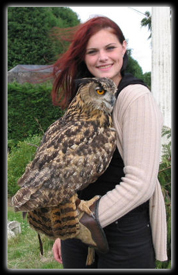 On our Owl Encounter you will get to grips with our wide variety of Owls. Learn about their habitat, how they hunt and their preferred prey whilst handling and flying them. This is a must for the Owl enthusiast, the complete beginner, or a child at school learning about British wildlife and birds. We have three of the indigenous species of British Owls - these are the Tawny Owl (Strix aluco), Barn Owl (Tyto alba) and Little Owl (Athene noctua). To top this we have also have a large collection of non-native species including the European Eagle Owl (Bubo bubo), Siberian Eagle Owl (Bubo bubo sibiricus), Boobook Owl (Ninox boobook). Of course we have every childs favourites, immortalised by J K ROwlings Harry Potter, the Snowy Owl (Bubo scandiacus) and Great Grey Owl (Strix nebulosa). We must stress however that these amazing Owls are not really pets, or witch/wizard familiars and cannot be kept in small cages. These are films and as such do not portray the real world. In fact these Owls are the hunters of the coldest parts of the world. The Snowy Owl uses its plumage to disguise itself as well as keeping its feet warm, whilst the Great Grey Owl uses its large disc eyes to concentrate sound waves in order to locate prey which keeps itself mostly out of sight under snow. Who needs eyesight when your ears are as good as theirs! From the largest of Eagle Owls to the smallest of Barn Owls, these birds never fail to amaze the young and old alike with their friendly, placid manner. These silent predators have earned both respect and fascination from humans and have even been worshipped by some races. Come and learn how the plumage of an Owl is very important in order for it to hunt and why many of its bones are hollow. Feel what it's like to be the prey of a European Eagle Owl as it swoops silently over your head. Awe at the down draught that must be created by it's flight feathers in order for it to swoop and grasp its prey in its large and deadly talons. 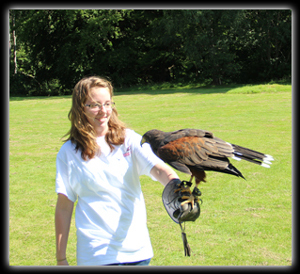 Or come just to get up close and personal to these amazing birds of prey. We offer Owl Encounters which can make a perfect surprise gift like nothing else. All equipment and training is provided, you only need to bring yourself! 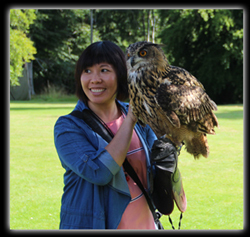 An Owl Encounter provides a good introduction and experience to maintaining these mystical birds of prey. In fact you may enjoy it so much that you may wish to pursue falconry further. If this is the case we can provide you with friendly professional tutoring, guidance and advice. Please feel free to telephone to discuss your needs. 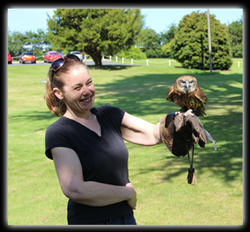 Please note that if there is a particular Owl you would like to meet, handle and learn about, please notify us when you book. This is so that we can make sure that we have the bird available for your visit. This will also help us to tailor to your every need so we make your encounter even more enjoyable. Owl Encounters are available on a pre-booked basis only, last 1 hour 30 minutes. 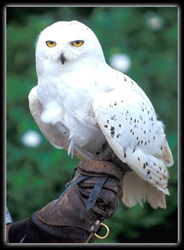 Thank you for choosing to purchase an Owl Encounter Experience Gift Voucher! These make an ideal gift for birthdays, christmas presents or purely as a gift to someone with an interest in Owls!